Meet Me in St. Louis (1944) – Vincente Minnelli’s timeless classic now rereleased by the BFI – is like an old friend you only see occasionally. Within five minutes of meeting again you remember why you love them so much, as they take you back nostalgically to a time when everything seemed so much better. The film traces the ups and downs of the four daughters of the Smith family from St Louis – the burgeoning love lives of the two elder girls Rose (Lucille Bremer) and Esther (Judy Garland), and the predicaments their two younger sisters Agnes (Joan Carroll) and ‘Tootie’ (Margaret O’Brien) constantly find themselves in – as the story follows the seasons of the year in the lead up to the 1904 World’s Fair. When their father Alonzo (Leon Ames) decides to take up the offer of a job in New York, his family’s reaction to the news makes him think again, and focus on what’s really important in life. 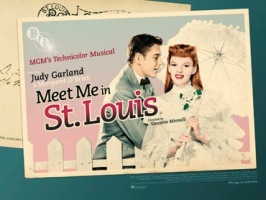 Meet Me in St. Louis, made when Garland was still on a career high from the phenomenal success of 1939’s The Wizard of Oz, despite being a product of its time still manages to feel as fresh as when it first aired over sixty years ago. Though clearly no expense was spared – the film cost over $1.7 million to make (which was hardly skimping it in 1944) – and whilst George J. Folsey’s cinematography and the vibrancy of the film’s Technicolour makes the costumes and scenery jump from the screen in an almost artificial way, it works as a whole because of its strong storyline of family values that transcends time and which we all like to think we still believe in deep down, especially at this time of year. The production, however, really belongs to two of its stars. Garland, with the famous Trolley Song (which she reputedly did in one take), and O’Brien (who was given a special child Oscar for her performance) exude an effortless confidence which lights up the screen, reducing the rest of the cast to mere bystanders. Made just as the world was emerging from a devastating war and still had many years of austerity ahead Meet Me in St. Louis, with songs like Have Yourself a Merry Little Christmas – the film’s most famous and achingly sentimental ballad – gave audiences the hope that tomorrow would be better and all their troubles would “seem faraway”.